Belgian style farmhouse ale balances a bold, spicy yeast character with a dry hoppiness. A significant addition of malted rye adds further complexity without betraying the styles roots. GABF gold medal winner 2007, 2009 and 2010.
we tried almost all the beers they had in here, and this was definitely one of the best, and certainly the best of the not hoppy stuff. its pale golden in color and very bright in the glass. there are really two types of saisons in my mind, the rustic funky old world types, and the more or less wheat beer fermented with a saison strain, much less nuanced and more of an american belgian type of thing. this is more the latter than the former, although its about as good as that type of saison can be, at least for me. really super clean, with a distinctive yeast strain thats fruity like orchard fruit and white grape, and with a decent little floral hop kick in the finish. i also dig the grain here, the wheat seems cleaner and more refined than many, and the rye malt addition is not lost at all. its also insanely w ell carbonated and crisp as it finishes in a way thats uncommon in the style. subtle peppery spice marries the rye and the yeast, and the hops keep it fresh and delicate. i could see this doing amazing things with a brett pitch and a chardonnay barrel, but its mighty tasty as it is, and a really solid offering from these guys, seemingly leagues better than some of their other beers. not sure why there is a separate listing for draft of this one, i have to assume they are the same beer no? really enjoyable brew here! (A)- Pours a cloudy pale yellow color. Some good white froth. (S)- Pretty dry with some orange peel. Slight Brett-like funk. (T)- Fairly dry with lots of orange peel. Slightly sweet with minimal funk. (M)- A bright and lively carbonation level. Nice balance of sweet, dry, and funky. 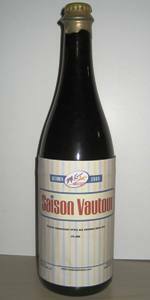 (O)- A good Saison from the states. Not too sweet, but balanced well overall.